During manufacture Volvo Penta's OceanX stern drive uses state-of-the art electro-deposition to stream onto its casting a titanium-ceramic coating, a cocoon really, one that greatly improves corrosion resistance by preventing the metal castings from contacting water. Highly durable and flexible the coating covers the entire drive for maximum protection. In fact, it actually permeates the aluminum molecules. Because the powder coating is chromate free, it's environmentally friendly. The good news gets even better. 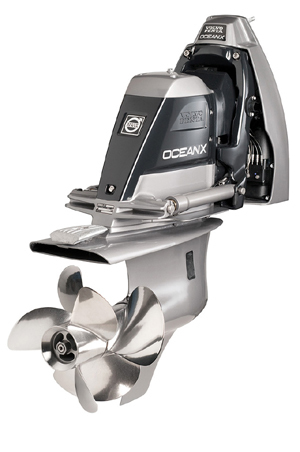 The OceanX drive also includes two new features never before incorporated on a sterndrive package. Gas engines only, though. An oil sensor warns the boat driver when gearcase oil runs low or is contaminated with water. You already know that a large percentage of a marine mechanic's work is changing leaking prop shaft seals. Or even worse, gear sets destroyed when water intrusion has done its damage. This sensor will go a along ways towards preventing that expense and hassle. Yet another sensor, mounted in the universal joint bellows between the OceanX drive and the boat transom, sounds a warning if water has entered that critical area which could otherwise lead to failure. The 140- and 170-horsepower models are available with the SX single-propeller drive or the DPS Duoprop (pictured above) while the 200 and 220 horsepower models are available with the DPS Duoprop.